Known as one of the most important writers of the 20th century, Hunter helped pave the way for a new generation of journalists and readers. The Father of Gonzo Journalism, and apt observer of the American scene for four decades, his work continues on. With every page that you read of Hunter’s work, your own personal strength is invigorated — Confidence is what readers often describe as their first benefit from reading his work. As Hunter once wrote: “Music has always been a matter of energy to me, a question of Fuel. Sentimental people call it Inspiration, but what they really mean is Fuel.” Whether it be confidence, a sense of fuel and music, or fun and political activism, we thank you for keeping these important principles alive. Hunter rocked the foundations of traditional reporting and challenged traditional politics. The Gonzo Foundation strives to support those who wish to continue the work he started. 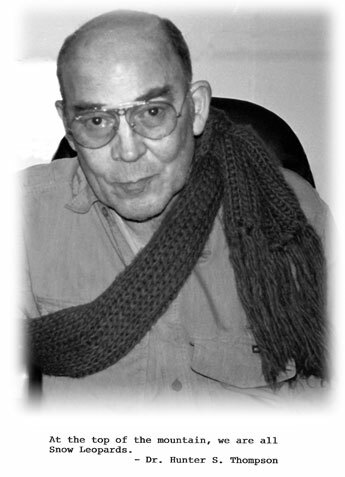 Hunter S. Thompson was born in Louisville, Kentucky in 1937. He died at Owl Farm in 2005.